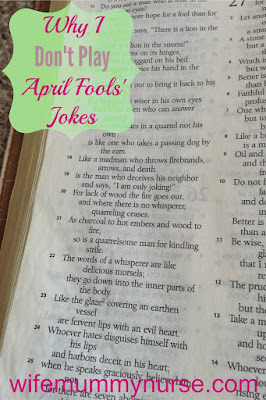 Before I married Drew, I LOVED playing pranks on people, but my husband always hated pranks and practical jokes and often quoted Proverbs 26:18-19. Looking back, I now realize that some of them were hurt or annoyed people. On this day, many women post pictures of pregnancy tests or ultrasounds. People start congratulating them, but the next day, they post, "I'm joking! April Fools'!" I have always hated "jokes" like this (even when single and newly married), because it is lying. A few years ago when I was wanting a second child, false announcements tore the wounds open some more. While you may think, "It's just for fun. It's only a joke." No, it's a lie. Again, you are lying and trying to bring all the attention on yourself. What do you think of the false pregnancy announcements women often make today? BlogHer Writing Lab April 2016 Prompts. I have never been a prankster. One, keeping a straight face is beyond me and as the constant victim of pranks- I was like Drew, not a fan. 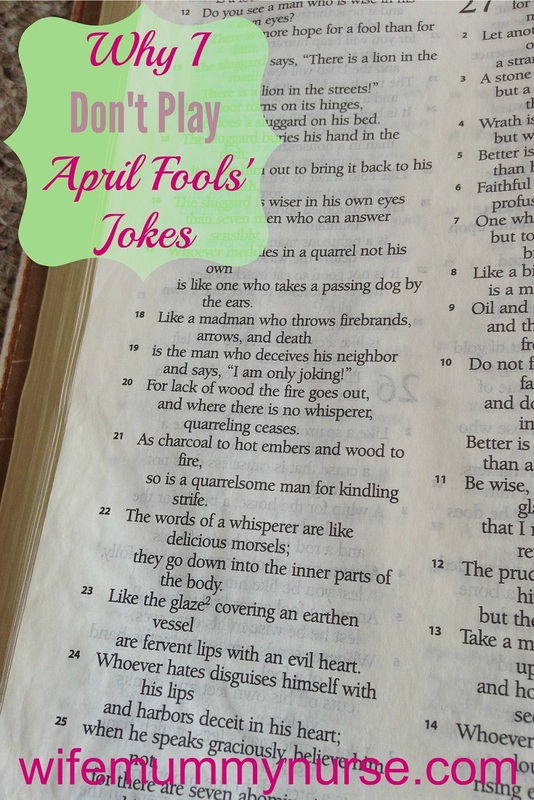 I've never been much for April Fools pranks, either. And I spend the day skeptical of anything and everything someone says and does! I think those are mean. If it's a cute prank, like cutting a hole in a glass so you spill milk all over yourself, well those are pranks. But false announcements are not nice. I have always hated practical jokes. Many of them, such as the ones in your examples, are far from funny and can hurt people. I'm glad you pointed that out. I love jokes but I'm not really good at practical jokes and I never liked it when they were played at me. I didn't know if I would go as far as saying that these are lies but I don't see the joke in these kinds of posts or fake announcements either.